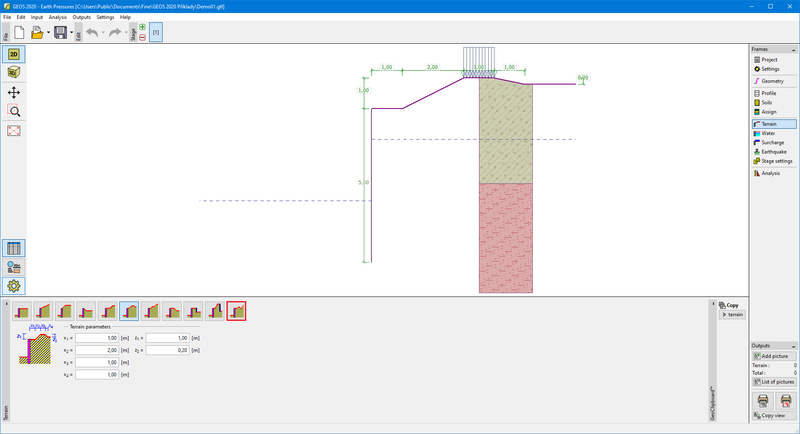 The "Terrain" frame allows, by pressing the button, for specifying the terrain shape. The selected shape with graphic hint ("Chart of parameters") of input values is displayed in the left part of the frame. The terrain shape can be edited either in the frame by inserting values into input fields, or on the desktop with the help of active dimensions. The last option to choose from is a general shape of a terrain. In this case the frame contains a table with a list of terrain points. The first point with coordinates [0,0] coincides with the top point of a structure. Analysis of earth pressures in case of inclined terrain is described in the theoretical part of the help "Distribution of earth pressures for broken terrain".